Hi Everyone!!! Candi here from chaos-n-crafts.blogspot.com again with my second guest designer post for June. As a reminder this month is featuring Blue Berry trendy twine, and you still have a couple of days to enter the challenge Trendy Twine June Challenge. My project for today consists of a gift for my 8yr old daughter, a dream journal for recording her dreams, a twine wrapped pen (which I feel every lover of twine needs), and a bookmark for her before bed book reading. I used the Blue Berry trendy twine and 2 buttons to form a sort of clasp for the journal, the papers inside are also attached with twine. I found pens at Target which I could take apart and wrap the barrel with twine before reassembling, and lastly I made a tassel for the bookmark. If you'd like details on this project please visit me on my blog. I hope you've enjoyed my projects this month and aren't sick of me yet, since you're stuck with me for the next 6 months <wink> I'll be back next week as part of the new design team! I created this box card by cutting a piece of paper to 5.5in x 9.75in and scoring at 4.25in, 4.75in, 9in, and 9.5in. When you fold it up you will see it becomes the size of an A2 card that is 1/2 inch deep, You will use the last bit that is 1/4 inch to adhere the card to itself completing the square. Then I used my spellbinders labels 8 (the second to the largest one) to cut the opening. 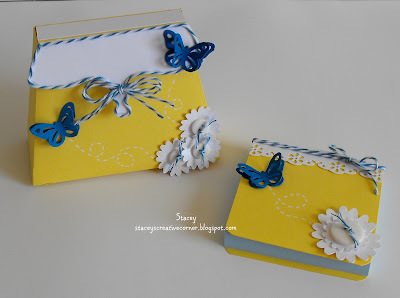 The butterflies are dangling by some Blueberry Trendy Twine that is adhered to the top on the inside of the card. I finished my card off by adding this fun "Enjoying the ride" sentiment from the My Thoughts Exactly Up, Up, and Away stamp set. Hi Everyone! Candi here from chaos-n-crafts.blogspot.com. 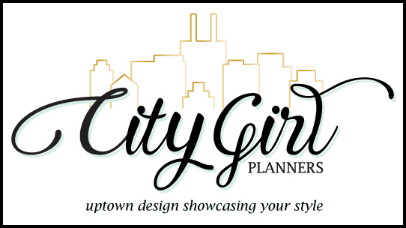 I'm thrilled to be a guest designer this month and to share my projects with you! I absolutely love the Blue Berry trendy twine and couldn't wait to work with it. I've decided to keep with the theme of butterflies & birds which is used for this months challenge. I love making two part gifts so my project for you today is a shadow box card with hanging birdcage & a birdcage complete with 3d paper bird & perch. I used a sweet little bow of Trendy Twine to hang my birdcage on the card and used it again to wrap the base of my birdcage and to ensure our little feathered friend didn't escape by wrapping the cage door. I'd love to share more details with you, please feel free to visit my blog. Look for me again next week when I'll be back to share another fun project! Have a wonderful day! It's Jamie here to share another Trendy project with you! so I decided to go outside my normal paper crafting and make a bracelet. Cute right?! 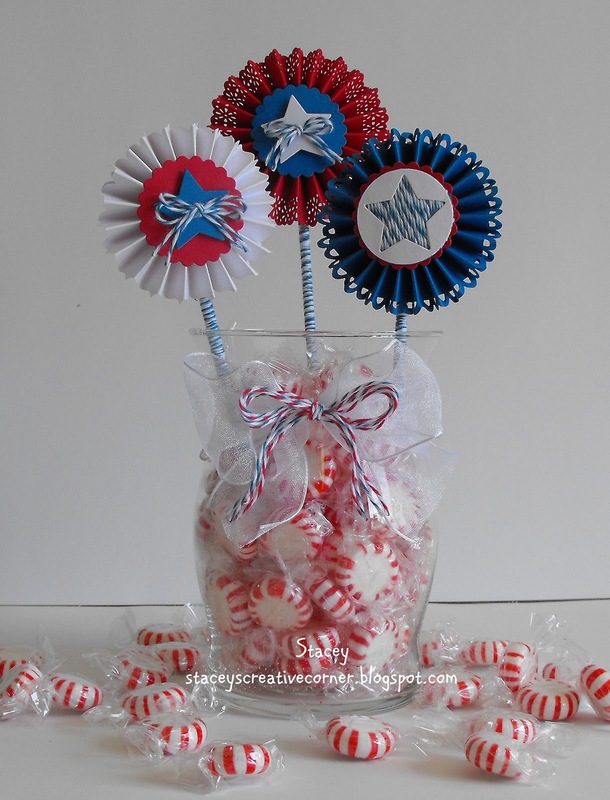 Plus you can use it to wrap a sweet or sour treat with and then the receiver can wear it. Check out all the details on how to make this on my blog. Don't forget with have our Monthly Challenge going on HERE. 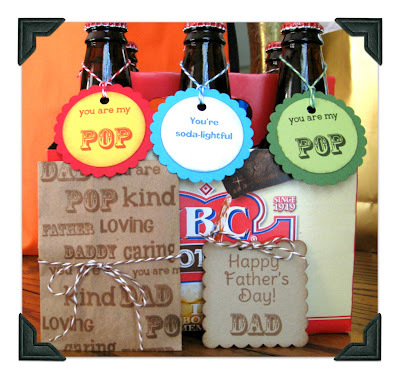 I hope everyone one had a nice Father's Day with the dads in their lives. I had to work today, but went to see my Dad and Grandfather afterwards. I just wanted to share my super quick and very simple Father's Day gift. My family is kind of the same about gifts. We don't want a lot of cluttery stuff that just takes up room somewhere, so we usually do cash or gift cards. As I said earlier, everything was very simple. For one, I waited til the last possible minute; and two, I had to make two other gifts. Dad thought the Root Beer was a cute idea. I wanted to add a sweet little treat to his gift card, so I was happy he liked it. Hope you have a super fabulous week, my twiners! Hello everyone, I am back this week for my second guest design day featuring Blue Berry Trendy Twine. 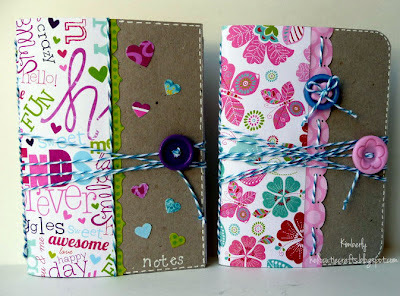 Today I am sharing a card which is more in line with the "You Make Our Hearts Flutter" Trendy Twine challenge this month. 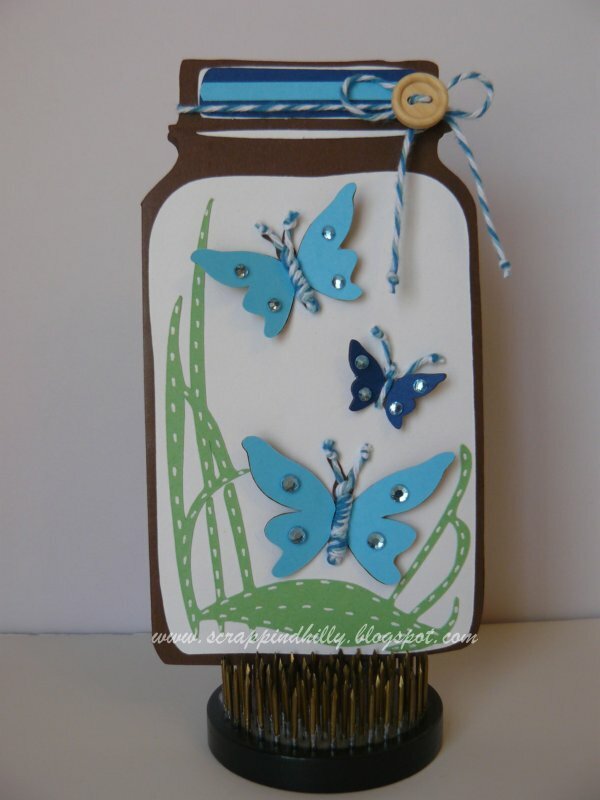 I used the Blue Berry Trendy Twine on the butterflies and at the top of the butterfly jar. The bow was then finished off with a kraft button. For more details on my project, please feel free to stop by my blog. I am looking forward to returning next month as a Trendy Twine design team member, have a great day! Today I am sharing some Pinterest inspired notebooks made with Blueberry Trendy Twine. I used cereal boxes for my covers and computer paper for my notebook paper. I bound it together with Blueberry Trendy Twine and made a wrapping closure with the same twine. and you can make them with your own style. For all the fun details, check out my blog. Don't forget to check out this month's Trendy Twine Challenge. Next month starts the new Design Team!! Stacey from Stacey's Creative Corner here to show you my project using the beautiful Blue Berry Trendy Twine. I decided to make a cute little 4th of July centerpiece for my dining room table. I am so excited to be a guest designer today and have the opportunity to play with the Blue Berry Trendy Twine. I love the combinations of the dark and light blue colors with the white in this twine. For my project, I created this two page 12x12 layout. Can you believe it's already June! is featuring Blueberry Trendy Twine. Now for some design team inspiration. pairing of the yellow and the Blueberry Trendy Twine. look at the cute little twine belly. 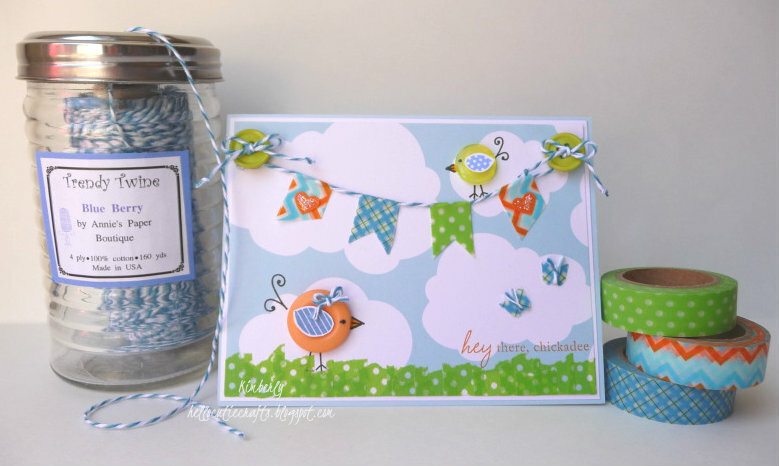 Cute little washi tape and Blueberry Trendy Twine banner card. This adorable little crocheted butterfly detaches from the card to be used as a hair pin! Trendy Twine, and at least three buttons. (**No Trendy Twine yet? That's okay too. Project must be new for the challenge, no back linking, and only one entry please. Must include all the items for the challenge. 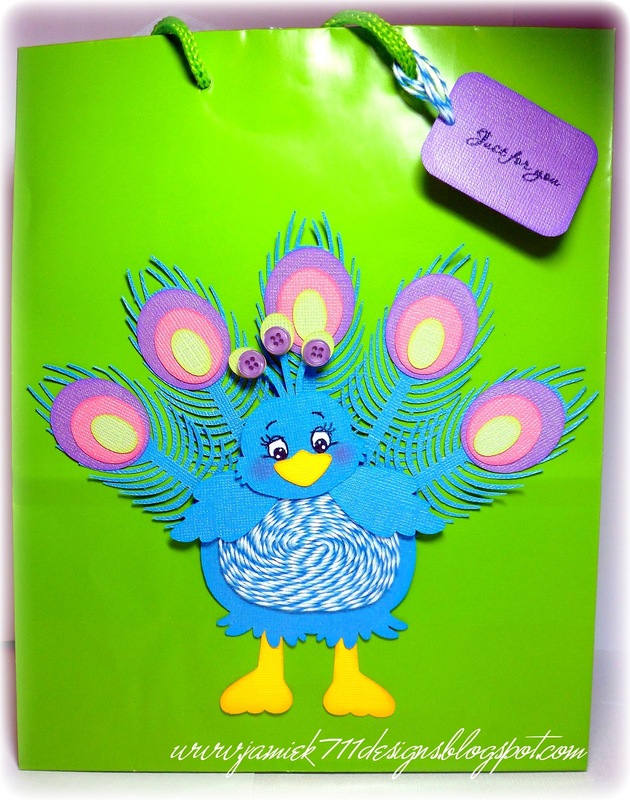 May's Challenge winner was Jessica with Chick-N-Scrap. projects by visiting their blogs and leaving some love! We can't wait to see what you create for the challenge!